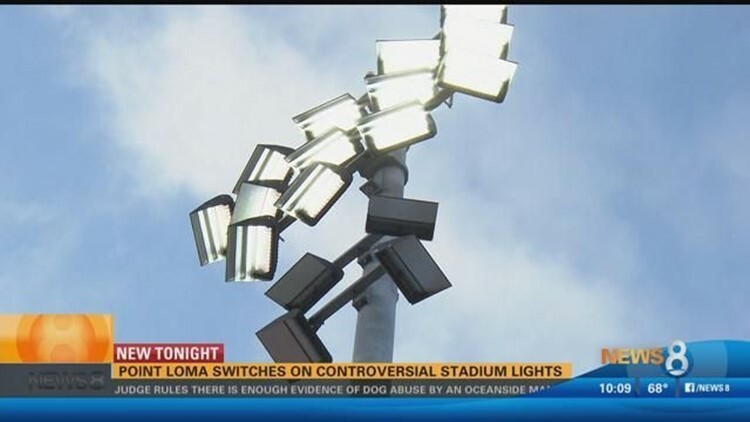 POINT LOMA (NEWS 8) – A new era kicked off at Point Loma High School Friday night as the football team played its first game under newly installed LED lights – lights that attracted plenty of controversy from the surrounding neighborhood. The Pointers may have lost their season opener, but for the first time in 93 years, the Point Loma High School football team has its own Friday night lights. “It feels like I am in Texas,” said Ryan Little, a high school senior. Before the newly installed lights, the team would have play after school, while there was still sunlight. Homecoming was the only night game, but the school would have to rent loud portable lights. “I am in high school. This is my time to shine. I am really hyped about it,” said senior running back, Josh Ball. But as the sun set – angry neighbors were found living in the shadows of the newly bright lights and P.A. system. “This is terrible. The whole neighborhood is pretty upset about it. I mean look at the noise. Look at the parking spaces,” said Angie Poppe, a Point Loma neighbor who opposed the lights. Earlier this year, a judge ruled in favor of the school district after a group of neighbors filed a lawsuit claiming the stadium lights and new P.A. system did not meet environmental standards. “We don’t’ want a tug-of-war with anyone – especially our community,” said Coach Hastings. Even with the new lights installed, the school will only be allowed 18 night events and practice until 7:30 p.m.
No outside groups will be allowed to use the stadium at night.